The development of generic skills (often referred to as ‘soft skills’) in accounting education has been a focus of discussion and debate for several decades. During this time employers and professional bodies have urged accounting educators to consider and develop curricula which provide for the development and assessment of these skills. In addition, there has been criticism of the quality of accounting graduates and their ability to operate effectively in a global economy. Embedding generic skills in the accounting curriculum has been acknowledged as an appropriate means of addressing the need to provide ‘knowledge professionals’ to meet the needs of a global business environment. 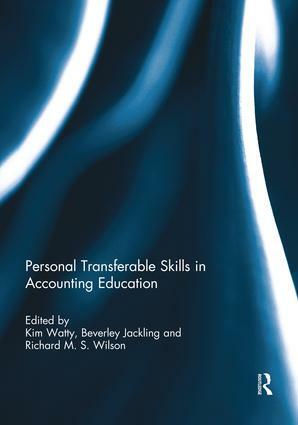 Personal Transferable Skills in Accounting Education illustrates how generic skills are being embedded and evaluated in the accounting curriculum by academics from a range of perspectives. Each chapter provides an account of how the challenge of incorporating generic skills in the accounting curriculum within particular educational environments has been addressed. The challenges involved in generic skills development in higher education have not been limited to the accounting discipline. This book provides examples which potentially inform a wide range of discipline areas. Academics will benefit from reading the experiences of incorporating generic skills in the accounting curriculum from across the globe. This book was originally published as a themed issue of Accounting Education: an international journal. Kim Watty is Professor of Accounting in the School of Accounting, Economics and Finance at Deakin University, Australia. She has published widely and completed major research projects in accounting education, both nationally and internationally, and is an Associate Editor of Accounting Education: an international journal. Beverley Jackling is Professor of Accounting at Victoria University, Australia. Her research interests include the educational aspects of business and accounting education. She has published widely in accounting education and been the recipient of numerous national and internationally competitive research grants and awards. She is an Associate Editor of Issues in Accounting Education.